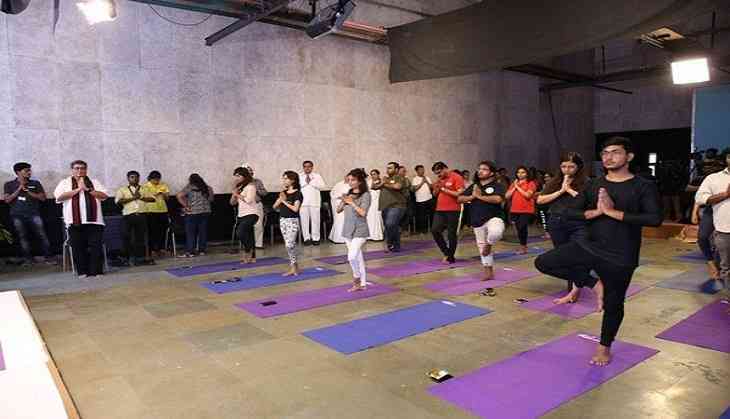 Renowned filmmaker Subhash Ghai, who celebrated Yoga Day in his acting and filmmaking institute, stressed upon the importance of yoga for youth. On the occasion of International Yoga Day, Ghai said, "Yoga is an internal bath for the body, mind and soul and every individual should practice it ardently. I've been practicing it myself for the past 40 years. Yoga in India is considered to be a 3500-year old ancient practice for the mind, body and soul." He added, "The youth of this country needs to understand the value of this amazing gift of our age-old culture. There is an urgent need for the youth to recognise that yoga can help them stay calm and achieve greater success in the modern world of cut-throat competition." The International Yoga Day was celebrated amidst much fan-fare at Whistling Woods International (WWI). The event witnessed the esteemed presence of Subhash Ghai, Founder and Chairman, WWI along with the members of Brahma Kumaris and Deepti Talpade. They practiced a number of yoga asanas with faculty members and students at the WWI campus, thereby, highlighting one of the most integral aspects of Indian culture. The celebration of yoga day began with the screening of educational videos, which demonstrated the techniques and benefits of yoga. The video screening was then followed by a soulful performance by the students of WWI School of Music. While addressing the students of WWI, member of Brahma Kumari said, "We have taught our younger generation to read, write, solve mathematical queries, but not to think to be creative. The practice of yoga in our daily lives helps us think above the obivious." The students and faculty members enthusiastically participated in the celebrations on the day. The institute has inculcated healthy habit of practicing yoga in its students by making necessary resources and amenities available to them on campus. Concluding the event with a vote of thanks, Subhash Ghai said, "At WWI, we have regular yoga classes on campus. Being a creative institute, yoga and meditation is an integral part of our educational philosophy."